open our own self managed super fund"
We offer two distinct SMSF options. The first is perfectly suited to people who want to set up a self managed super fund with expert guidance. The second option is for investors who want both financial planning advice and a complete administration and taxation service. If you are ready to proceed with the setup of your fund, please either complete our online application or download our interactive application form. Selfmanagedsuper.com.au is part of the Best Interest Advice Group, and is one of Australia’s leading self-managed superannuation administration and financial advisory firms. To learn more about our service offerings please contact us now on telephone number 1300 664 118. If you want to discuss the self-managed super setup process with one of our Client Managers please register your interest by clicking below. Alternatively, if you are ready to establish your fund, please complete either our online or PDF application. To register your interest complete our Contact form. Click below to download our interactive New Fund Application form. Once your application has been submitted we will be in touch to check and confirm all the trustee information and also the membership data before we submit your application to our legal team for processing. If you would like our office to take over the administration of your existing self-managed super fund, please click below to download our Existing SMSF Takeover form. What is included in our SMSF service? Our systems have been specifically built to accommodate the numerous and diverse challenges involved with the SMSF administration and portfolio management process. Our Model Portfolio. Global Economy. Selfmanagedsuper.com.au is one of Australia’s leading independently owned self-managed superannuation administration and financial advisory firms. In addition to providing a personalised self-managed super administration service, our online portfolio management system provides the tools that self-managed super trustees require to effectively manage. Through our relationship with our Dealer Group, Best Interest Advice Pty Ltd (AFSL 292925), we also offer a comprehensive financial advice service to all of our self-managed super clients and since 2006 we have helped thousands of Australians with their wealth management, insurance and estate planning advice. 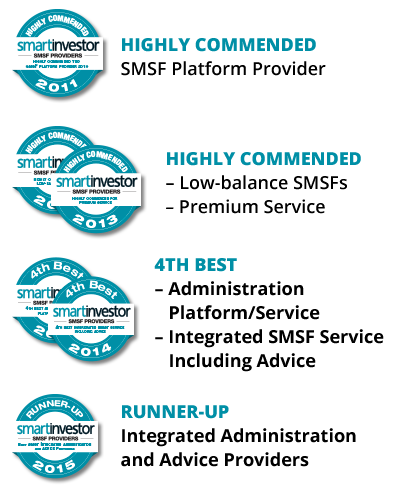 In 2013 Selfmanagedsuper.com.au featured in the Australian Financial Review’s Smart Investor Magazine as one of Australia’s top 10 self-managed super fund Administrators in both the Premium and Discount. Best Interest advice is an AFSL holder registered with ASIC to deal in securities and provide both general and personal advice. In 2013 we launched the specialist services of Selfmanagedsuper.com.au which now looks after the administration and compliance services for the trustee clients of Best Interest Advice. To learn more about our service offerings please contact us now on telephone number 1300 664 118. Our business has changed its name from Self-managed Super Institute Pty Ltd which began in 2003 and is known as Best Interest Advice to better cater for the advice needs of investors and also be able to licence other Financial Planners and Accountants in the provision of personal advice and administration services for Self-Managed Super Trustees. Please click on the link below to view our latest newsletter: Summer 2015 In this newsletter we look at the following: – How to handle a mortgage rate rise – Debunking insurance myths – How to transform your new year 'resolution' into a 'revolution We hope you enjoy reading it! Please click on the link below to view our latest newsletter: Win The Investment Race by Navigating Risk In this newsletter we examine risk and particularly: – What types of risk investors face – Risk tolerance – The importance of diversification We hope you enjoy reading it! Please click on the link below to view our latest newsletter: International Trade Barriers Come Tumbling Down In this newsletter we examine Australia's recent signing of Free Trade Agreements by looking at: - Potential upsides and downsides - The backlash - Where you should be investing We hope you enjoy reading it! To discuss the self-managed super setup process with one of our Client Managers please register your interest by completing the form below. © Best Interest Advice Pty Ltd.